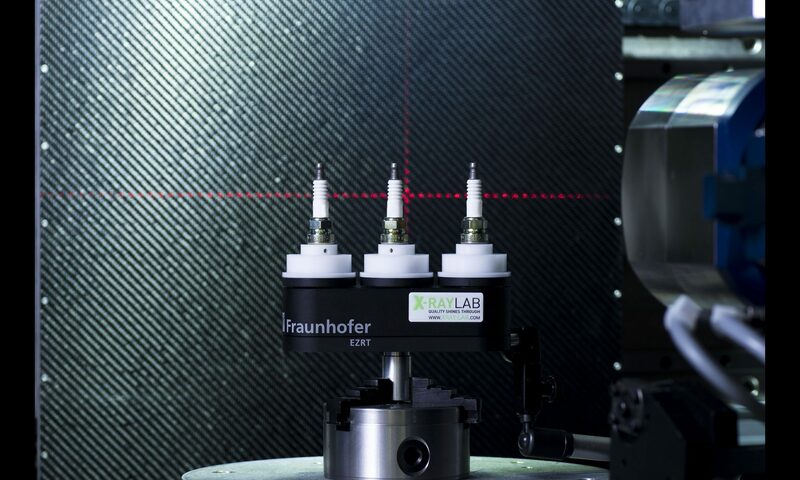 xray-lab and the Fraunhofer Development Center for X-ray Technology (EZRT) present the PolyCT as an intuitively usable add-on equipment, which can reduce the scanning time by a factor of 3 – especially with complex inspection tasks, such as analyses of highly x-ray-attenuating objects. The patented new product combines precision mechanics, CT know-how a well as progressive reconstruction algorithms to an easily usable tool for every CT laboratory. In particular: PolyCT is compatible to all the common CT systems on the market and is easily put into operation in few short steps. This way, the operator can use this upgrade kit for various machines. Additionally, once the system is installed, it does not interfere with the standard CT functions and does not adversely influence the quality of the results. The upgrade can be easily performed even between scans. The measuring device is clamped into the CT chuck instead of the sample(s) or directly mounted on top of the rotary table using a centering adapter. The PolyCT kit enables optimum use of the detector areas due to individual rotating centers. Thereby less angular increments are necessary compared to a standard CT scan. The data processing is automated by the usual reconstruction software and does not require further intervention in the existing system architecture. The combination of precise mechanics, easy handling and the Fraunhofer reconstruction software enables a user-friendly application in every inspection laboratory.